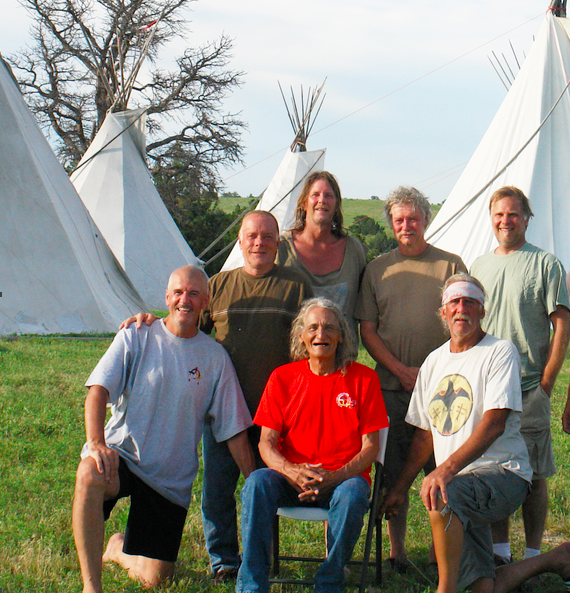 I have been honored to participate for the past 12 years in an annual Lakota Sundance prayer ceremony in South Dakota. 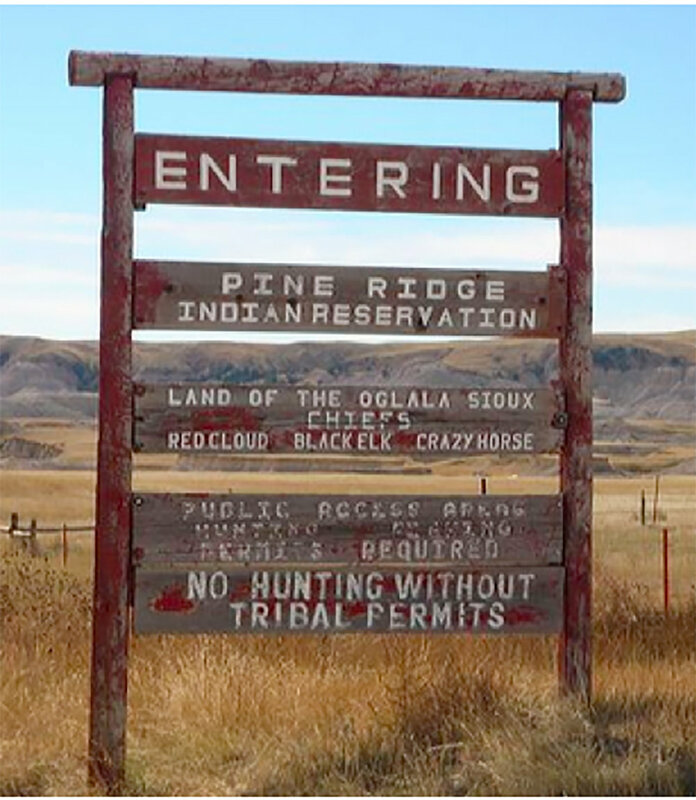 After 11 years on the Rosebud reservation, this year several of my Sundance brothers and I decided to move to a different Sundance in the Black Hills near the Pine Ridge reservation. The Lakota Sundance is an indigenous ceremony of prayer and sacrifice that is held “so the people may live.” Sundances are held in many locations throughout the world but the majority are held in South Dakota, traditional homeland of the Lakota Sioux people. I have to admit I was nervous about moving to a different dance, different leadership, different customs, different location, not sure what to expect, preparing physically, mentally, spiritually. There was also the basic question of acceptance. Some Sundances are restricted to native people, some to strictly Lakota people. As an Irish-Italian white guy with an open heart and strong spiritual nature and dedicated to the ways of the Red Road, I decided to just have faith and go with the flow. COMING HOME: Returning to the sacred Black Hills for our 12th year. It all turned out beautifully. Our entire group was welcomed in a good way. My new Sundance leader is down-to-earth, trustworthy, a good, spiritual man. This particular dance has been held for the past 18 years at a spectacular location on the banks of the Cheyenne River in the sacred southern Black Hills on an 11,000-acre wild horse sanctuary. Good people. Good energy. We felt right at home. MY SUNDANCE PATH: I’ll never forget my introduction to these sacred ways back in 2004. A friend and I drove from Arlington, Texas, to meet with a large group of Sundancers and supporters in Odessa, Texas. We then caravanned the 900 miles through Oklahoma, Kansas and Nebraska finally arriving at a private, remote property in St. Francis, South Dakota, on the Rosebud Reservation. After carefully maneuvering a rugged dirt road out in the country we suddenly crested a hill and stopped. As we looked down into the valley below we could see the Sundance grounds, the Sacred Tree from the previous year still standing in the center of the arbor wrapped in prayer ties with its beautiful, multi-colored prayer flags streaming in the breeze from its upper branches. STUNNING SPIRITUAL SIGHT: My view from the top of the hill at that instant, seeing the Sacred Tree and beautiful Sundance grounds for the very first time, literally took my breath away. It was such an incredibly welcoming and intensely spiritual sight and feeling. I had the immediate, intuitive feeling and powerful inner knowing that I had been here before, that I was coming home. However, at the exact same moment, there was also a simultaneous shock to the physical senses and intellectual slap in the cerebral face of the logical, rational brain of this white guy from upstate New York who had never visited South Dakota before in his life. How could these feelings possibly be true? COMING HOME: After much prayer and meditation and being open and receptive to my own personal divine guidance I finally realized the truth . . . IT WAS REAL! I HAD been here before. Just not in this lifetime. And not as a white guy. I came to know intuitively and positively that I had definitely participated in this ceremony many times before this lifetime. There was no question in my mind. It was such a relief. It was exciting. It was scary. It was a rush. I WAS coming home. 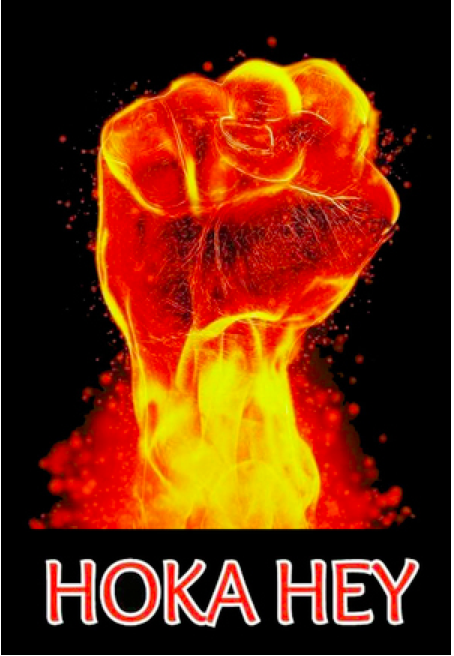 FIRE TENDER: And so my personal sacred journey on the Red Road began. For the next four summers I respectfully served at this beautiful annual ceremony as a fire tender -- chopping wood, transporting water, first aid, security, drum repair, tipi construction, building sweatlodges, smudging dancers with burning sage, cleaning the arbor, carrying the super-heated Grandfathers (Sacred Rocks) from the Fire into the Inipi circles, animal wrangling, snake removal, assisting the Sundance chiefs and dancers and supporters in any and every way necessary, keeping the Sacred Fire burning and the Sundancers' personal C'anunpas (Sacred Pipes) safe and dry during intense rain storms in the middle of the night, dealing with the wild South Dakota weather: blazing heat, freezing cold, wind, dust, flooding, stunningly beautiful and incredibly peaceful starry nights, ALL OF IT . . . serving and doing whatever was necessary on those sacred grounds during this amazing and spiritually powerful Lakota prayer ritual for the people. It was hard work. It was a great honor. It was humbling and empowering all at the same time. I listened. I learned. I prayed. And then, in 2007, I was intuitively called by Great Spirit to enter the circle myself as a Sundancer and honored to carry a Sacred C'anunpa in a good way. I have been fortunate to continue making this special journey to the Bad Lands every summer since to continue to sacrifice and pray "so that the people may live." 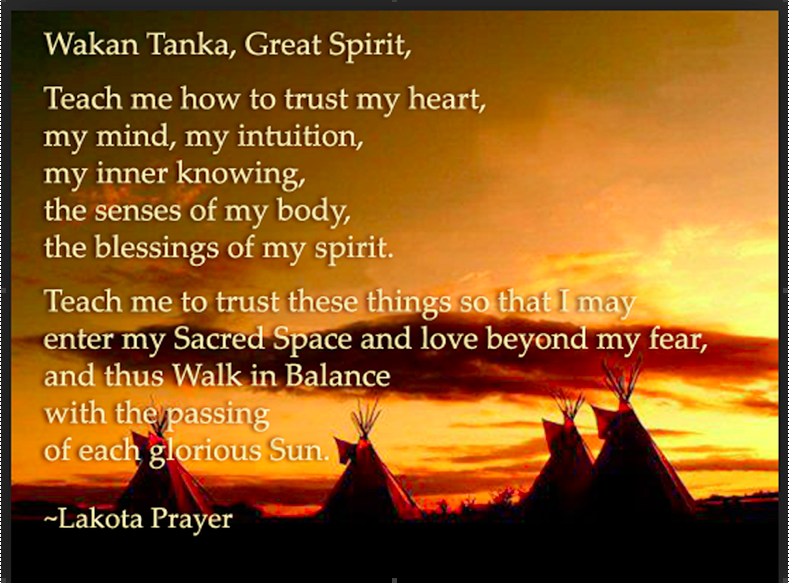 It is a powerful and humbling spiritual calling and I am grateful to have the opportunity to return each year to this sacred Lakota Sioux prayer tradition in THIS lifetime. 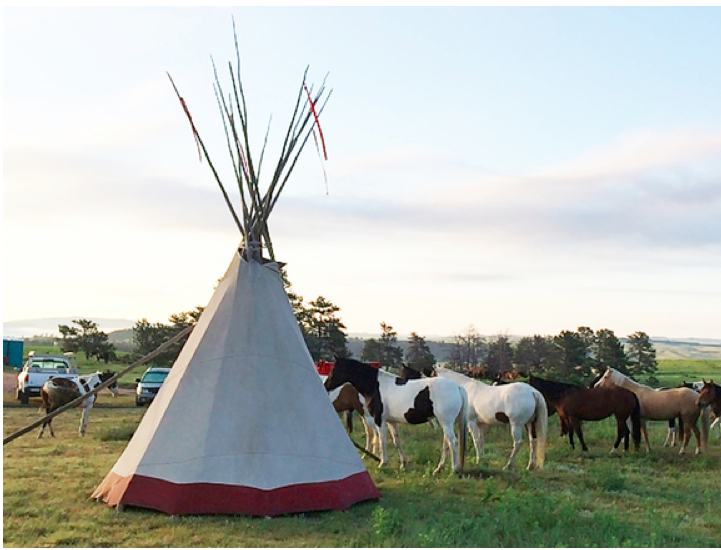 SACRED BLACK HILLS: Our new camp this year is located on the banks of the Cheyenne River on an 11,000-acre wild horse sanctuary in the southern Black Hills. Portions of the excellent Hollywood film, "HILDAGO," based on the true story of Frank T. Hopkins, a cowboy and dispatch rider for the U.S. Cavalry, half white and half Lakota, who had once been billed as the greatest rider the West had ever known, were filmed in this location. 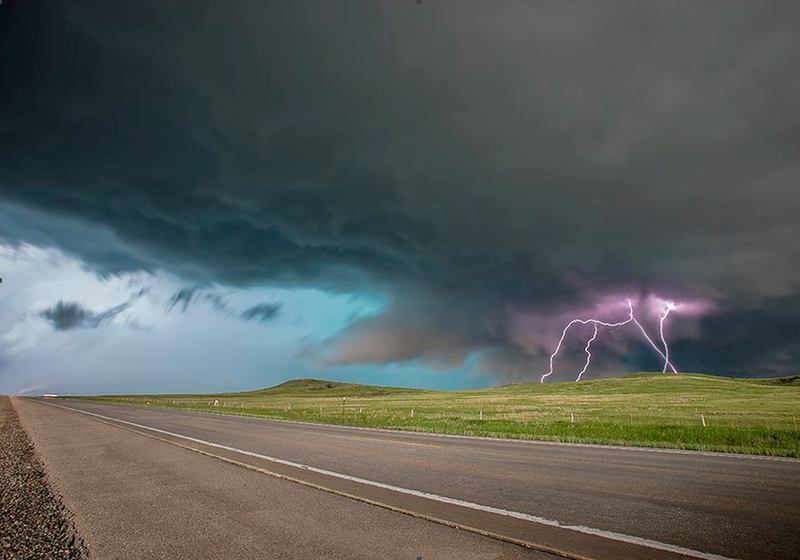 SACRED BLACK HILLS, SOUTH DAKOTA: My trusty little Italian eco-hot rod Fiat 500 made the 3,000-mile round trip from San Francisco Bay to the Bad Lands in fine fashion. Traveling to these sacred Black Hills each summer is a powerful spiritual pilgrimage for me. This journey is also a long-standing tradition for many generations of Lakota Sioux warriors and medicine men throughout history who traveled on horseback from great distances to attend and pray for the people at these sacred annual ceremonies. WILD HORSE SANCTUARY: On our second morning on the Sundance grounds I was awakened early to hear wild horses grazing just outside my tent next to my neighbor’s tipi, energetically one of the most beautiful places ever. So humbled and excited about upcoming Sundance ceremony and dancing on these sacred grounds. LAKOTA SPIRITUAL HISTORY: Prior to Tree Day several of my brothers had the opportunity to visit the Crazy Horse Memorial, just a short drive from our new Sundance grounds in the southern Black Hills. They were so honored to meet my friend and mentor Ed (Eagle Man) McGaa who has an honored space at the facility just outside the Crazy Horse video theater and sells his books about Lakota wisdom and spiritual traditions and waxes eloquent about a plethora of other worldly topics. 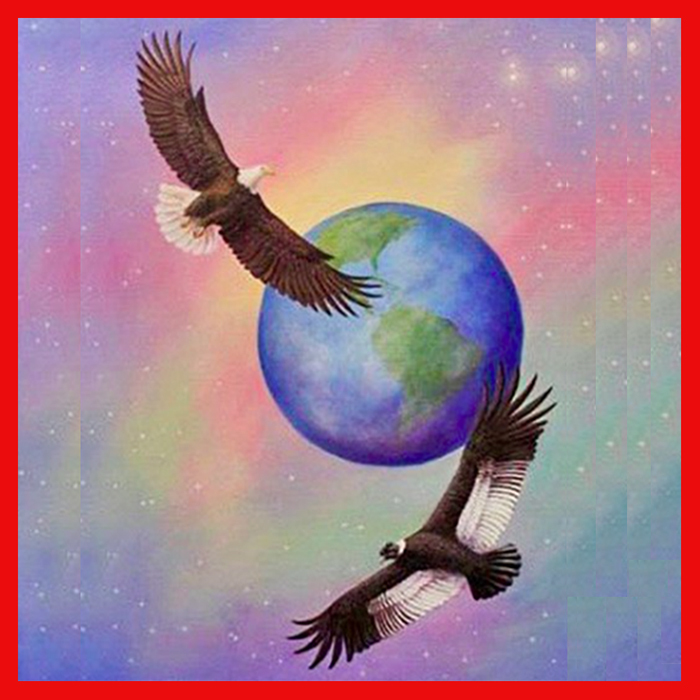 The first book I ever read about Lakota spiritual ways many years ago was Eagle Man’s “Mother Earth Spirituality: Native American Paths to Healing Ourselves and our World," an excellent resource for anyone who wants to learn more. Another unexpected treat and great honor for me this year was to meet and pray with Vic Glover, a Vietnam era combat medic who so beautifully assists our Sundance leader during ceremony at the Tree with the medical aspects of our prayer and sacrifice. His book, "Keeping Heart on Pine Ridge: family ties, warrior culture, commodity foods, rez dogs and the Sacred," provides powerful insights and background info about our indigenous brothers and sisters who live here on the Pine Ridge reservation. SUNDANCE INIPI SWEATLODGE: A very important part of the Sundance experience is the Inipi sweatlodge ceremony which is held for the dancers every morning before we enter the circle and every evening at the end of the day. At this Sundance they have two very large lodges, one for the women and one for the men. The men’s lodge is physically massive, holding over 45 men at one time. And the length of the sweatlodges was long, sometimes lasting over 2-3 hours. Several times I sat next to a Sundancer who is a retired firefighter with PTSD (post traumatic stress disorder) and a strong fear of heat, darkness and confined places. Being in the sweatlodge was the ultimate test for him. Whenever I began to feel uncomfortable I instantly thought of my brother sitting next to me who demonstrated such strength and courage and warrior spirit. It was my honor to be in ceremony with him. My temporary little discomfort with the heat and cramped conditions was an incredibly small sacrifice compared to many people really suffering in this world. We prayed for all the people. We sang the Lakota songs. It was good, healing medicine. 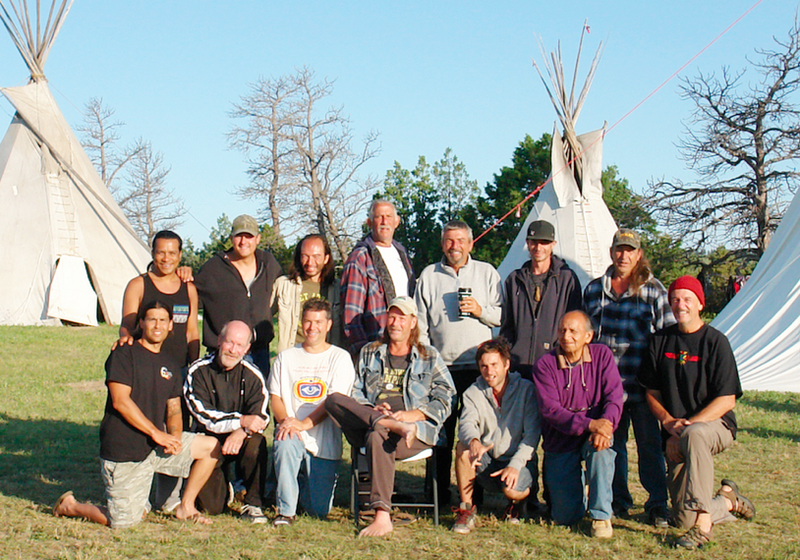 SACRED PATH INIPI SWEATLODGE: I vividly remember attending my very first Sacred Path Men’s Retreat many years ago and the wonderful Inipi sweatlodge ceremony that was set up for us so nicely on the mountain. Led by Lakota Sundancer Thomas Alvarez, the ceremony was beautiful, the Lakota songs, the drumming, the prayers for the people. Today I embrace the exact same positive feelings of connection with Mother Earth and heartfelt prayers for all the people when I’m in a lodge ceremony in the remote Black Hills at Sundance or praying in the Inipi sweatlodge with my MCLA brothers up on the mountain overlooking Malibu and the Pacific Ocean. The feeling is exactly the same. Mitakuye oyasin (Lakota) . . . We are all related. We are all connected. TREE DAY: The day before Sundance begins is called Tree Day. This is the day that everyone goes out to a predetermined location to bring home the special cottonwood tree that will be used for the ceremony. Tobacco and prayers are offered thanking the Tree for giving its life so that this sacred ceremony may be held for the people. After prayers of thanks the Tree is cut down by hand and then very respectfully taken on the shoulders of the men being careful to not let the Tree touch the ground. 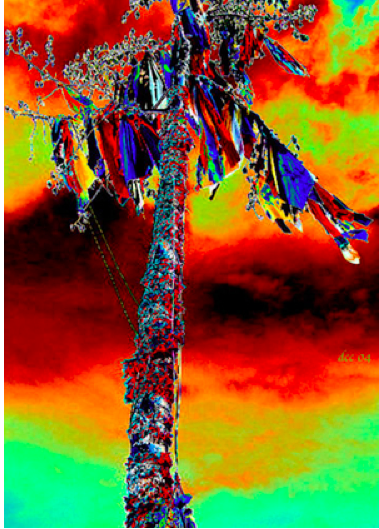 It is then carefully and respectfully prepared on the Sundance grounds, prayer ties and prayer flags are added by the Sundancers and supporters, and the Tree is finally pulled into an upright position by the ropes of the Sundancers and secured in the ground. The Tree will continue to stand for the next 12 months carrying the prayers and beautiful spiritual energy of everyone who participated in the four-day sacred ceremony. MOHAWKS: My new Sundance brothers, Al Brant & his son Rawa (at right), from the Tyendinaga Mohawk Reservation in Ontario, Canada. 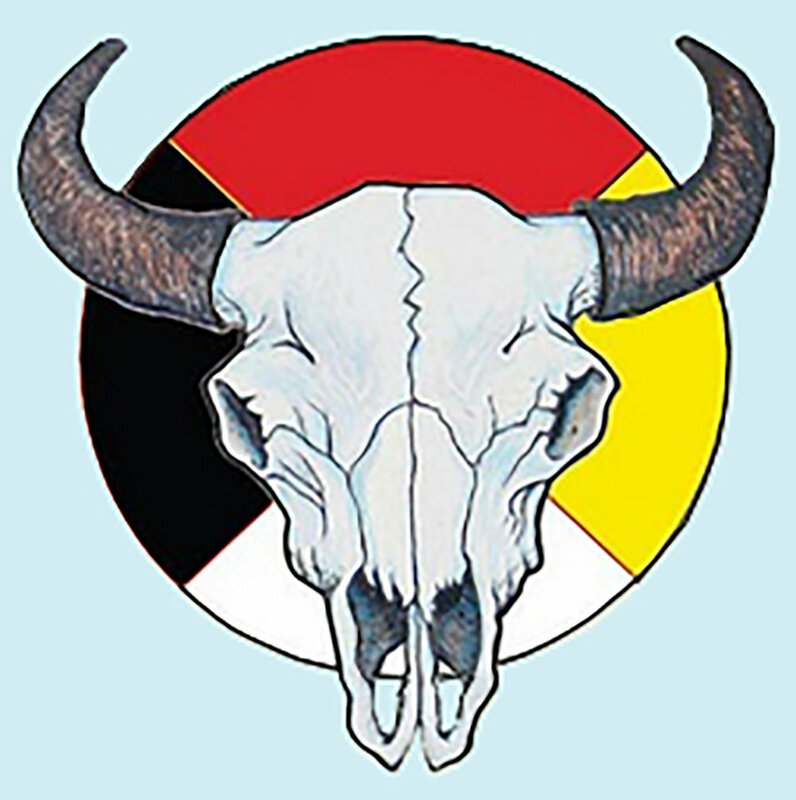 Al works at the Joyceville Minimum Institution Prison and facilitates Inipi sweatlodge ceremonies at the prison for the large percentage of indigenous inmates. This was Al’s eighth year to Sundance and Rawa has been in circle since the age of 12. Good energy. Good men. Good prayers. LEADERSHIP: Our Sundance leader, Tom Cook, is a Mohawk from upstate New York, married to Lakota Loretta Afraid of Bear. Wonderful energy, excellent leader. Instantly connected with him. My own birthplace of Rome, New York, in the beautiful Utica-Rome Mohawk Valley in upstate New York, is not far from his birthplace. Growing up in upstate New York I knew the names of the local tribes: Oneida, Mohawk, Onondaga, Seneca, Cayuga, Tonawanda, etc., but nothing of the culture or beautiful spiritual ceremonies of indigenous native people in this country. Finally, in 2004 I had just moved to California from Texas and was invited by a friend to attend my first Lakota Sundance on the Rosebud reservation in South Dakota. It was a life-changing experience. NATURAL HEALER: One of the many highlights of this year’s Sundance for me personally was watching my new Sundance brother Russ Weiser being led to the Tree and stretched out on his back on the buffalo robe to be prepared for a sacred part of the ceremony. Russ’ sister Andrea and 6-year-old little blondie girl niece, Vija, were then respectfully led to the Tree to be in support. After Andrea and Vija knelt down at Russ’ head to hold the energy, little Vija intuitively reached out and placed her little hands on Russ’ head. It was so beautiful and moving. I was later told that little Vija is “a natural healer.” Definitely. I will continue to hold that beautiful image in my thoughts and prayers throughout this next year as we prepare for our next ceremony together in the Black Hills. DIVINE FEMININE: Adding their wonderful balance of divine feminine energy to this traditionally male sacred ceremony: our Sundance sister Kerry (at left) from Long Island, New York, and her supporters helped everyone stay balanced and focused in a good way. Wopila my Sundance sisters. GROUNDING: It’s a scientific fact that walking barefoot at the beach or on a field of dew-moistened grass is very therapeutic and beneficial. Called “grounding” or “earthing,” those tingling or positive sensations we feel are the result of direct barefoot contact with the surface of the Earth which brims with natural, subtle energy. Since the earth is an electrical planet and we are bioelectrical beings, this natural connection with Mother Earth is very powerful and very positive. Some Sundancers wear moccasins during the four days of the ceremony but most dance in bare feet. Entering and praying in the circle in bare feet has always been my custom and personal preference. I feel a special connection with Mother Earth and love to absorb the powerful, positive energy that flows up from the ground and empowers us all. It’s a wonderful feeling to kick off your shoes and just feel the energy of Mother Earth . . . and that intensity and connection is even more powerful inside the Sacred Circle. GRATEFUL: So honored to share sacred time with these men (at right). Tom Cook, our grounded, down-to-earth spiritual leader and wayshower, kept us strong and focused all four days of this powerful ancient ceremony. Although this was a new Sundance for our Arizona / Pennsylvania / California group, it was the 8th year we’ve danced together in a good way. DRUMMERS & SINGERS: Being in the Circle for four days can be a challenge physically, mentally and spiritually. One amazing source of power that Sundancers greatly appreciate is the powerful drumming and singing generated in a good way for this ceremony. These ancient Lakota songs of prayer, thanksgiving, humbleness, appreciation, and love are expressed so beautifully through the rhythmic drumming and excellent singing. Sometimes, at the end of a particularly difficult round as the dancers are waiting to be smudged with sage and exit the sacred circle for a brief rest, the singers and drummers end their singing and drumming and we’re still standing there in the circle, now in silence. At this point especially many of us feel like clapping and cheering for the drummers for their wonderful support and healing energy. But we don’t. That’s not the custom. 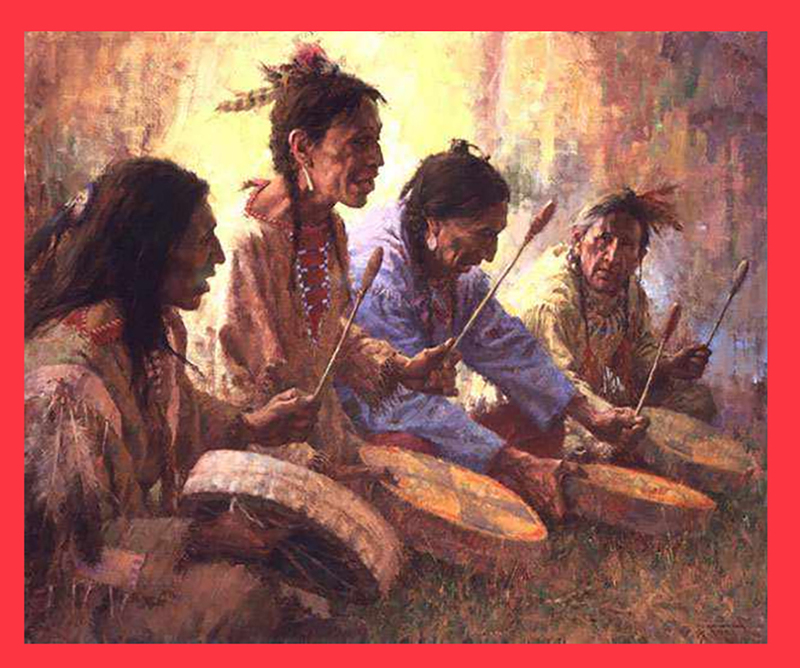 Instead we blow our eagle bone whistles and extend our spiritual thanks quietly and respectfully to the beautiful drummers and singers who provide so much to this powerful ceremony. FAST FOR THE PEOPLE: Fasting is part of the Sundance spiritual commitment for the four days and three nights of this sacred ceremony. And so, like clockwork, once again this year during the third round of the third day the hunger really hits me . . . HARD. My physical body is in the circle enveloped in the Sundance energy while my consciousness is in an altered and heightened prayerful state of being. I'm doing my best to stay focused on my prayers for the people when, suddenly, for some unknown reason, I begin to visualize a big, juicy jalapeno cheeseburger and huge side order of golden brown fried onion rings and chilled tomato ketchup. My mouth begins to water. It's all I can think about. OMG, it’s like torture. SACRIFICE FOR THE PEOPLE: This crazy cheeseburger ritual I go through EVERY year during the third day of the dance is particularly insane since I’m now a vegan and haven’t touched meat in over four years. For some reason my personal food obsessions and intense spiritual and physical visualizations in the circle continue to taunt me even here in the Black Hills. Sacrifice for the people. Overcome these limiting human characteristics. MITAKUYE OYASIN. We are all related. We are all human. But I ALSO realize intuitively our true nature as eternal spiritual beings living only temporarily in these physical, flesh & blood & bones, human bodies, dancing now in the South Dakota sun, hot, hungry, tired, thirsty, confused . . . off into the ethers I march to square up against my human, rational, limited, intellectual brain as it shifts into obsessive menu mode, juking and jabbing, trying to bully me and belittle me: "Come on kola! Have your lost your mind? Who do you think you are? What do you think you're doing out here? Your body needs food. EVERYONE needs to eat food. Even vegans. And especially vegan Italians." MAMA MIA! PRAY FOR THE PEOPLE: And so, after 30 or 40 minutes of this self-imposed mental food torture, fortunately, my internal, spiritual guidance kicks back in. I distinctly hear a Lakota elder's voice speaking to me, calmly, clearly, with love in his heart: "Hoka hey my son! "Wasaka enaun (Stay strong). You can do this. We are with you" . . . slowly, I look around at my brothers and sisters in the Sacred Circle with me. I am gently and intuitively moved to re-focus and re-enter my prayer consciousness. I take a deep breath and blow my eagle bone whistle. My feet return to these holy and sacred grounds. The rhythmic drumming aligns with my heartbeart. I sense the ancestors looking down upon all of us with love and compassion. My spirit is renewed. I know intuitively that we're all in this together. I know we're here to pray and sacrifice "so that the people may live." And I am so incredibly grateful . . . my prayers strengthen my body, my spirit is recharged. We all continue together in a good and strong way. The ancestors are with us. The drummers drum. The singers sing. The dancers dance. ONE HEART, ONE MIND . . .
FEAST FOR THE PEOPLE: At the end of the fourth day, after the final exit round and after our final Inipi sweatlodge ceremony, a huge group of volunteers brings an incredible assortment of food up on the hill to the Sundance grounds for a fantastic feed for the dancers and all the people. These beautiful young ladies (at right) are just some of the volunteers from across the country and the world who come here to serve the people and bring light and love to this amazing ceremony (there was plenty of incredible food even for us weirdo vegans in the crowd). Wopila tanka to everyone who helped out in a good way. It was wonderful. PHETA KIN ILEYA HAN CHA WASTE' . . . When a Sundancer commits to dance in the sacred circle the typical commitment is four years. I have just now completed my eighth year of Sundancing and have taken it on as one of my life’s spiritual callings. My personal commitment is to continue dancing for as long as I am physically capable. This is similar to my feelings about the Sacred Path men’s retreat. Every spring and every fall I commit to making the 800-mile round trip from San Francisco Bay to our mountainside retreat high above Malibu and the Pacific Coast Highway to be with my MCLA brothers . . . and every summer I commit to be in the Black Hills of South Dakota for my annual Sundance prayer ceremony. These are important parts of my life and I give thanks for the wonderful opportunity to be of service in South Dakota and pray for the people and also to connect twice a year with the good men of the Sacred Path. Wonderful balance. Powerful energy. Personal and honored sacred commitment to recharge the spiritual batteries in a good way. In the beautiful Lakota language: Pheta kin ileya han cha waste' ("It is good to keep the fire burning"). WOPILA TANKA: This group of Sundancers (above) gathered on the sacred grounds in southern Black Hills of South Dakota represents the cultural and geographic diversity of our world: Virginia, New York, Pennsylvania, Mississippi, South Dakota, Nebraska, Arizona, Chile, Australia, Washington, Scotland, Great Britain and California. It was amazing. So nice to have this solid group of new brothers to share the prayers, sacrifice, beauty, power and comaraderie of this ancient and powerful Lakota Sioux prayer ceremony for the people.. Mitakuye oyasin/We are all related. THE SUMMER SOLSTICE: The final day of this particular Sundance always falls on June 21st, the Summer Solstice or Longest Day of the Year. The Solstice marks the official first day of summer and has been celebrated for its symbolic importance in many cultures around the world since ancient times. I have personally always resonated in a good way with the powerful energies of the Summer Solstice and feel so blessed to finish the dance and stand up on the hill overlooking the Sundance grounds watching the Sun set on the horizon in all its glory on this beautiful longest day of the year. Additionally, in the Lakota Sioux tradition, the final day of this sacred ritual is also considered New Year’s Day, the first day of a brand new year leading to the next Sundance ceremony next summer. We begin now to prepare and get ready for our next gathering for the people in 2016. It is a joyous time to be alive. HAPPY NEW YEAR EVERYONE. BILL ARENA lives in the east bay San Francisco. He's an MCLA Wisdom Council agitator, Sundancer / Pipe carrier in Lakota Sioux spiritual tradition, Pachakuti Mesa carrier Peruvian cross-cultural shamanism, Jin Shin Jyutsu hands-on energy healer, Black Belt MMA instructor, guided group Meditation Leader, competitive Discus Thrower, open Ocean Endurance Swimmer, Animal / Bird wrangler, and head writer / editor / graphic designer ARENA CREATIVE GROUP.